This article explains the elastic design capabilities RadColorPicker offers. The Lightweight RenderMode of RadColorPicker supports elastic design as of Q3 2015 (Figure 1). Figure 1: Comparison between the appearance of a RadColorPicker with regular font size and with increased font size. RadColorPicker does not create elastic design by itself, but can fit in a page that follows this pattern. This means that its Lightweight RenderMode supports changing the font size without breaking the control's appearance - if the new size is larger than the original, the elements in the control will simply increase their size as well to accommodate the text. This fluid layout is achieved by using em units for setting dimensions and paddings in the control, instead of pxbecause em units are tied to the font size. This allows dimensions and sizes to scale with the font size. As of 2016 Q1 SP1 RadColorPicker takes the font-size of the page automatically. If the developer does not set it explicitly (Example 1), this is up to the client's browser and a common default value is 16px. Example 2: Changing the font-size of a RadColorPicker via page-level CSS rules. You can apply the CSS rule to the Color Picker only, or to its container if you do not want to change the entire page. 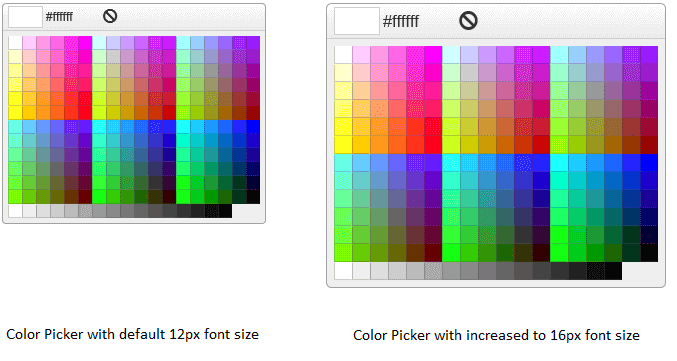 Example 3: Changing the font-size of the Color Picker via the control's Font-Size property.